63. Jumping or intermittent rotary motion, used for meters and revolution-counters. 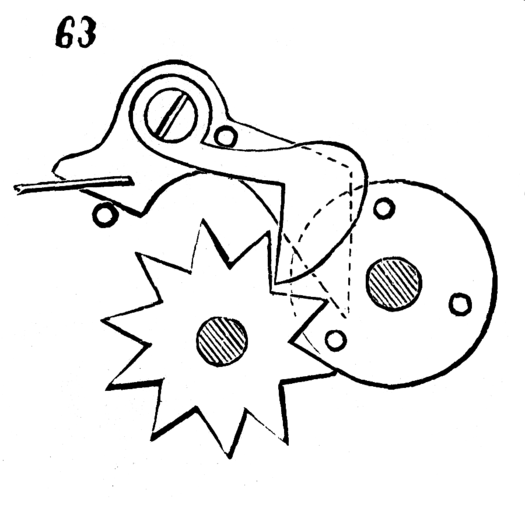 The drop and attached pawl, carried by a spring at the left, are lifted by pins in the disk at the right. Pins escape first from pawl, which drops into next space of the star-wheel. When pin escapes from drop, spring throws down suddenly the drop, the pin on which strikes the pawl, which, by its action on star-wheel, rapidly gives it a portion of a revolution. This is repeated as each pin passes.